Our award winning range of natural shaving soaps are excellent for sensitive skin. Our shaving soaps are made from a pure natural ingredients including oils and butters whcih result in a mild shaving soap which is suitable for sensitive skin. Our customer feedback informs us that many men have sensitive skin and men are now looking for more natural shaving soaps which do not irritate sensitive skin. Many men are making the switch to natural shaving soaps as awareness grows of the benefits of natural shaving soaps over conventional shaving soaps which can often contain harsh chemicals. 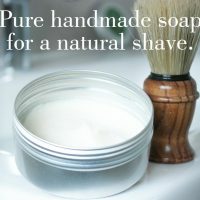 We have many testionomials from men who have made the switch to our natural shaving soap and feel the benefits of using pure natural shaving soaps.